PLEASE MESSAGE OR EMAIL TO TALK ABOUT PRICING AND PAYMENT SCHEDULE. My response time is great, and the book it now button has challenges:) Check the rates section for seasonal specials, Minimum 4 night stays over the Summer holiday and spring break(unless you are filling a smaller gap). 2 nights Minimum for other dates. Bring the family and enjoy our Sandy Toes Cottage. We hope you will enjoy it as much as we do. In 2007 our family went suddenly from two kids to four. We are a busy family and found that by the time we got done packing we were already worn out and we hadn't even been any where yet! So we have furnished it with convenience for families in mind. The kids room has two bunk beds and sleeps 4. There is a queen bed in the master bedroom, with a memory foam mattress. A futon in the living room is available for extra guests as well. There are plenty of linens so you don’t need to pack extra blankets. Westport is a fishing and ship building community that is quickly developing a reputation for great recreation as well. The beach is not at all crowded and sometimes even deserted if you get lucky. We have provided beach toys and chairs to share (because we were tired of packing them too!!!) We have provided things like a high chair and bed rail for the littlest visitors. We have a fully equipped kitchen including some extras like a bread machine and rice cooker. After a day at the beach the kids can play with all the toys, read a book or watch a movie while mom or dad makes dinner or takes in a movie as well. The town of Westport has go karts, fun shops with nick knacks, fudge and salt water taffy, a fleet of charter boats ready to take you fishing or whale watching, and a historic lighthouse. All of this can be reached by biking or hiking down the paved dune trail just down the street from Sandy Toes. We are a busy family with 4 kids. It is so much work to vacation with 4 kids and pets that we really needed a place that we could go to relax. 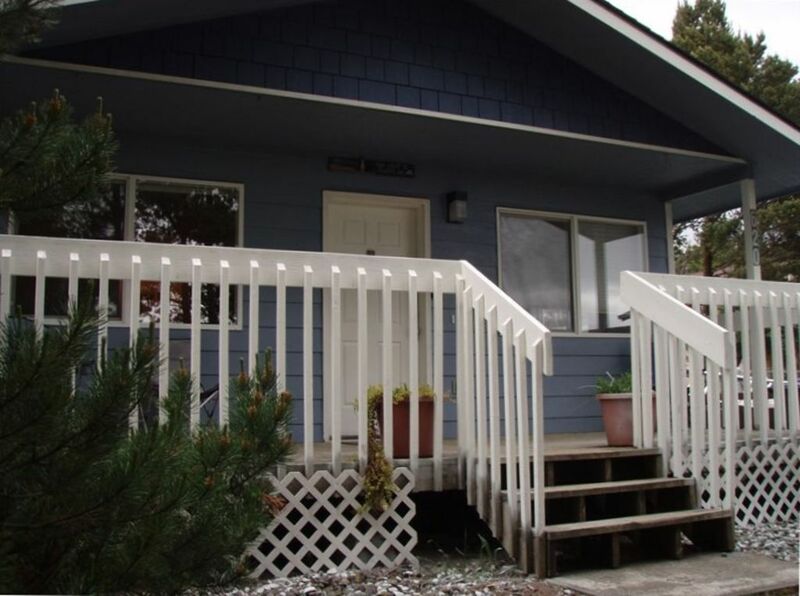 We live near the mountains and have family down in Westport so it seemed the perfect place to buy our own vacation rental and make it into our dream home away from home. We are so excited to share it with others. Wonderful quiet vacation spot. We spend a lot of time there with relatives close by and we were not happy with the rental options we had. We wanted a place that was kid, pet and parent ready. Everything we need to keep the kids happy and busy is already there. We keep the kitchen supplied with everything we need to prepare meals. It is ready for our dogs as well. It makes taking a vacation relaxing instead of work. We love our hot tub! Lots of choices for kids and adults. 4 person hot tub surrounded by a privacy fence in the back yard. Short walk to the beach! Near Washington's tallest lighthouse. Walking distance to paved dune trail along the beach. Walking distance to Westhaven State park. Very pet friendly, dog beds provided. Even more kid friendly! Kids room has two bunk beds (sleeps 4) and is decorated in an under the sea theme. Wonderful Beach and Biking Getaway! We loved our time at Sandy Toes - so close to the beautiful beach, perfect hot tub, and our kids had a blast riding the bikes up and down the street on the bikes and pegs! We walked to the Blackbeard Brewery for great pizza and beers after enjoying a great day of playing. The house was perfect for our needs - stocked kitchen, ample space for 4 kids and 2 adults, and the dryer came in handy in between beach and hot tub for our towel uses! We would love to come back! Wonderful place! Clean and cozy. We loved being a 5 minute walk from the beach and having a warm hot tub to come home to! Would definitely recommend! Thank you for leaving the house so tidy! Please come back anytime! I thoroughly appreciated not having to pack all the odds and ends a family needs to Travel. My kids loved the bunks! I should have paid attention that there was a double bed, not a queen. We bedshare with the toddler and a double is a bit hard to do that in. For that reason I may wait till toddler is in her own bed before staying again. Wonderful place for a ocean get away. Wonderful get away. Our family of 4 had a great two nights there. We enjoyed walking to the beach every day. Sandy Toes is a great place to stay. It is a great value, perfect location, and peaceful. The hot tub is an added bonus. It was clean and in perfect working condition. Our dogs love Sandy Toes as much as we do. This was not our first visit and won't be our last. Sandy Toes was clean and comfortable. Would recommend this VRBO with no hesitation. Thank you! We are happy to have you back anytime. Great location for a variety of seasonal activities. Clam digging, whale watching, cranberry festival, charter fishing, kite festival, crabbing, and miles of sand to play in. 30 days notice required to cancel your reservation. Our base rate includes 2 adults and kids stay free. Additional adults are $10 Clam dig dates vary and weekend clam digs are $155 a night, 3 day weekends have a 3 night minimum at $375 for all 3 nights or $450 for 4 nights. This 3 or 4 night special rate also applies to clam digs or any other off season nights. Not summer or spring break. We give better rates for longer stays!